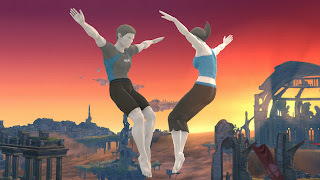 As you can see above the latest Smash Bros. image and information confirms that there will be a male version of the Wii Fit Trainer. Masahiro Sakurai sent a post to Miiverse (looks like I need to hang out there more often) confirming the male character. The general speculation is that the male trainer will be a costume swap for the female trainer. Okay so with this in mind do we get the female villager from Animal Crossing? In the picture it seems like they are mirroring each other and have the same move sets. Hopefully the male character will just be a costume swap and not a whole character. I do not want the same basic character taking up an unnecessary slot. New characters will be announced in the upcoming weeks as it has been hinted at by Nintendo. At this time there is no official release date but it will be launched in 2014. What are your thoughts on the new addition?